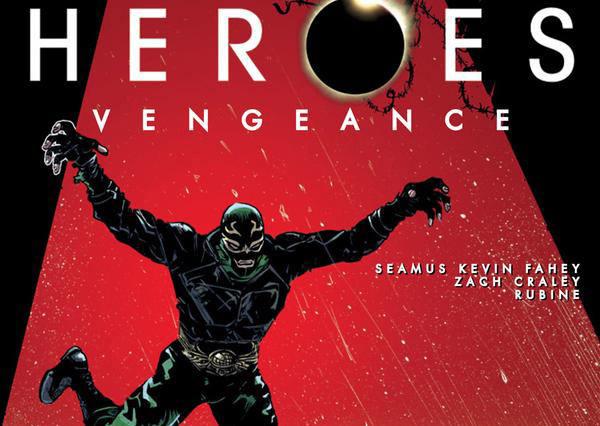 Titan Comics- HEROES: VENGEANCE #1 Review | Warped Factor - Words in the Key of Geek. Tony digs out his El Nacho costume. Nowadays of course there are streaming services to make sure you can catch those missed shows at your leisure. Assuming you have leisure. Nope – so far, have missed the start of that too. Naturally then, when the first issue of the Heroes comic-book came into WarpedFactor Towers, all eyes turned my way. “What?” I said. It was that sort of look that committed me to watching the fourteen godforsaken hours of Fortitude, Series 1. The Editor, the big cheese to whom even Wil Fromage bows, and the geek to whom even Geek Dave doffs his geek-cap, grinned and beckoned me over. For which, actually, I’m fairly grateful. Having access to Wikipedia like the rest of you, I get the idea of Heroes Reborn as a kind of “Season 10” of the original Heroes – things have moved on, EVOs (*cough, cough, X-Men, *cough) are popping up here and there in a world hostile to them after a terrorist attack in Odessa, Texas. Shenanigans will ensue, there will be violence, tension, conspiracy and all manner of really uncool things. The comic-book sets out its stall – before anything actually happens in the two-dimensional format, it’s going to give us a bunch of EVO origin stories. That should allow total Heroes-virgins like me to get up to speed with the world and the tone of the series, and hopefully, hook in to the TV version. The first issue introduces us to a Latino EVO who goes by the name of El Vengador and wears the costume and mask of a traditional Mexican wrestler. Most of the issue is actually told in flashback, showing two young boys, Oscar Gutierrez and his younger, wrestling-obsessed brother Carlos, living in a gang-troubled part of East LA. The issue takes us through their relationship in the 90s, with Oscar giving a present-day voice-over about what it means to be a hero – someone people look up to. He tells the story of his brother’s adoration of the wrestlers they watched, and one in particular – El Vengador. Even when Oscar, being a typical bratty teen and older brother, tells Carlos it’s all staged, nothing but pantomime and opera, his brother still idolizes the heroic El Vengador, and their father tells Oscar not to steal the hope out of his brother’s heart, to let him believe in something, some figure that can make a difference. It’s a kind of secular symbolism of salvation in a neighbourhood and a world that can be hard – a point the grown-up Oscar acknowledges in his voice-over through the lettering of Jim Campbell, when he says that the answer to the question of what a hero is was right in front of him all the time as a boy, meaning his own father, who worked hard to keep his family safe. Alongside the backstory, there’s a fairly standard Batman/Daredevil ‘saving a guy in a dark alley from guys with guns’ scene, the grown-up Oscar in his El Vengador costume beating the bejesus out of a gang of responsible gun-owners and sending their hapless victim on his way. And after a solid night of doing his El Vengador thing, and against a backdrop of the so-called ‘terrorist attack’ for which EVOs are being blamed (using newspapers with headlines of the terror attack is perhaps not the subtlest or most original way of rooting us in the world of the show, but it does at least inform complete newbies of where we are and what the societal pressures of EVO life are), Oscar goes home to his own family, his own wife and young son, having answered his own questions about the nature of heroism – a hero is someone who does what’s necessary to keep their family safe. 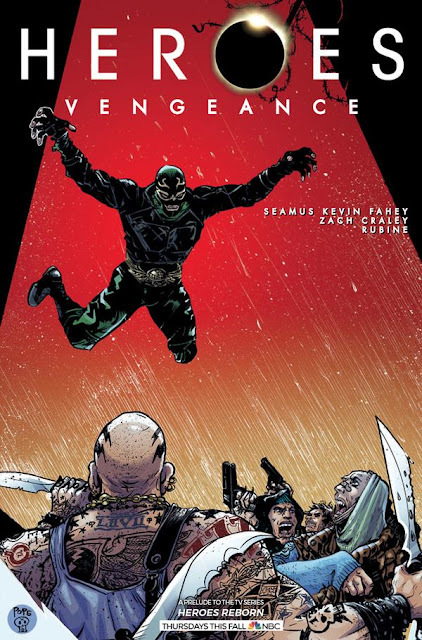 As backstories go, it’s a simple affair, and we get the distinct impression there’s as yet more to it that we haven’t seen – perhaps, to spur the connection between his brother’s passion for El Vengador the wrestler and his own adoption of the El Vengador persona as a masked crime-fighting vigilante, and given the answer he finds to the question of heroism, there’s some loss in his family to the gangs against whom he stands – hopefully if there’s more to his backstory, we’ll find it out through the action of upcoming issues. There’s a degree to which superhero shows of late have had an origin-story obsession (try checking out The Flash and finding an episode where we don’t learn how some metahuman of the week gained their powers), but in terms of what the Heroes comic-book is aiming to do, issue #1 is a good indication of tone – a little grittier than some DC offerings, it tangles with the transition from ‘ordinary’ to ‘extraordinary’ pretty much as an act of personal responsibility – we’re not all EVOs, but we can all strive to be more extraordinary in our day-to-day lives, and that feels like the journey Oscar’s been on. His path just comes with EVO add-ons, though we’re still a little unclear at the end of the issue exactly what his abilities might be – he’s certainly well built, and he notes that he can take a hit, having been attacked himself by the gang he disperses; presumably resilience and rapid healing are among his powers. While the tone of the writing by Seamus Kevin Fahey and Zach Craley helps establish the ‘kind’ of series this will be (and the kind of show too, we assume) – more everyday and ‘realistic’ than say, Agents of Shield or most of the DC stable (Note to self – dude, make time to catch some Daredevil, seriously…), with a philosophical core and some solid punches, it’s actually the artwork by Rubine that more effectively gets this message across – there’s a grittiness to the flashbacks and a griminess to the dark alley that says ‘yes, technically you’re in a comic-book, but this ain’t no comic-book world.’ The use of voice-over lettering, solidly separated from in-scene lettering by a Jim Campbell colour choice, again, tells us how the time-zones of the storytelling would probably be linked in a live-action version, and there’s a beautiful cinematic device on Pages 5 and 6 – El Vengador the vigilante in the ‘here and now’ strikes a pose of attack in the grimy back alley and by darkness for all of Page 5, immediately mirrored by a much brighter, more lively version of the same pose, in a flashback to El Vengador the wrestler in 1994 – it’s cleverly done, this duality, and it’s comic-book narrative delivered through the language of television. Those two panels are probably the stand-out art of the issue too, Rubine delivering the duality but also the transposition of the lesson through the sudden cut-back. This is who I am now – this is where I got it from, delivered with economy and with a pair of whole-page panels that impress the eye as well as getting the message across. Overall then, does Heroes, issue #1 ‘work’? Guardedly, yes. There’s an overhanging question in the way it sets out its stall – how long are we going to do origin stories? If we’re still introducing the ‘Hero of the Issue’ five issues from now, it will feel like overkill, but as a way of enticing a total Heroes newb to maybe go back and download the first episodes of Heroes Reborn, this does enough to pique the curiosity and inform us of the reasons why the show could be worth checking out. If you’re already watching Heroes Reborn, it also works as a kind of Easter Egg, an extension of the premise and the world – as far as we know at this stage (and forgive us if we’re wrong), El Vengador doesn’t feature in the TV show, but as has been the way since at least the sixties Batman series, and more potently since shows like Highlander, an awareness that there are other characters out there feeds the geek, feeds our hunger for new takes on the same events, and the origin story of El Vengador certainly does that – giving us a different view on the EVO life, its challenges and difficulties as someone else encounters them. Heroes, issue #1 is worth checking out for Rubine’s artwork alone, and whether you’re the office Heroes newb or a long-term fan, it’ll give you a new or additional take on the world of Heroes Reborn.